Wholesale Signs Fabricators is capable of fabricating any type of signage that you can dream of for your business. Do you need an electrical sign contractor and manufacturing company in the state of Florida? When you purchase a sign from us you are buying direct from the factory. We can offer you a high quality sign for your business at a reasonable price. It’s very important that your customers are able to find you and find you quickly and with ease. You don’t want to give them an opportunity to find your competitors. One choice is very clear: Channel Letters. You have seen them all around and you want one for your business too. You want a sign that captures the attention of consumers, as many as possible. Most of the national restaurant chains, grocery markets, pharmacies and retailers exclusively use channel letters as their preferred type of signage. Channel Letters are very effective and affordable for an exterior sign. We can build a sign to fit your budget. Well-made Channel Letters are a durable product and comply with most of the ordinances of cities and counties. We can fabricate any custom letters according to your project specifications. Channel Letters can be made in a great variety of styles, designs and colors. They can also be LED or Neon illumination or Non Illuminated. These are the most popular/common type of channel letters. As the name indicates, these signs emit illumination only from the front or face of the letters. They can be flush mounted, attached directly to the building facade or they may be mounted on a raceway. A raceway is a rectangular mounting structure that gets attached to the wall with aluminum brackets. The raceway serves as a container for the electrical components such as the power supplies and all the wiring connecting the letters. These type of signs are typically mounted on a building where electrical access is available. These type of Letters are Front and Back Illuminated and are the perfect choice for an immediate impact. The combination of both front and back illumination generates a brightness that creates instant attention for your business. Open Face Channel Letters are excellent for a type of business wanting exposure to customers. This type of signage is commonly found on restaurants, nightclubs and bars. These are standard Channel Letters and very similar in fabrication. The difference is that the illumination source for these letters is Neon and the faces are covered with clear acrylic to protect the neon from outside elements, like the weather and also helps keep birds from nesting in it. The clear faces allow for the exposed neon to be seen, adding a dimensional effect to your sign. With that in mind your customers can appreciate the beauty of the neon lights. Neon lights have been around over 100 years and these signs will never face. If you are looking for that wow factor this is the type of signage or letters for you! 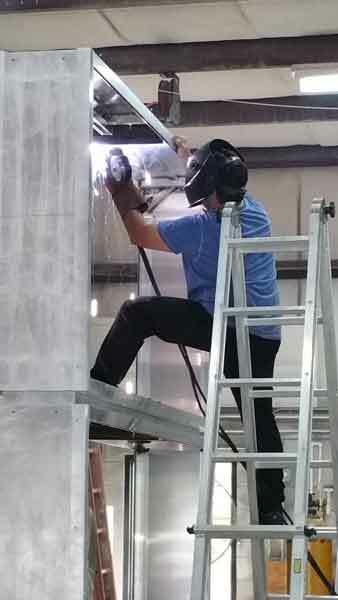 At Wholesale Signs Fabricators we can proudly still produce neon signs and our own owner is a master neon bender with almost 30 years of experience. We are a licensed and insured sign company located in the state of Florida. We offer a vast variety of neon glass for you to choose from for your sign. Most sign companies are not capable or licensed to manufacture neon signs, we can ensure you we can complete any project from start to finish and leave you 100% satisfied. If you are looking for a prestigious image reverse channel letters provide a distinctive and memorable approach to your clients. These letters do not illuminate on the face because the face is fabricated from aluminum and the aluminum returns are welded. The LEDs are installed inside on a clear Poly-carbonate back that protect the wiring elements and to prevent animals from nesting inside the letter. The inside of the back is painted white to reflect light. The letters are mounted separate from the wall allowing the illumination to show out from behind and around the edges of the letters. The materials and labor cost involved in the manufacturing of this product make them the most expensive type of letters. Reverse Channel Letters also called “Halo Lit” or “Back Lit” are known to many people for their elegance and the classy look of their appearance. With the sign industry evolving and advancing the creations are unlimited. Contour channel boxes also known as cloud signs are the sign style of choice for a truly different channel letter design. It is basically a channel letter with a contoured shape. This type of sign offers an alternative method to produce any font style and your very own customized logo. Contour Channel Box / Cloud Signs can be as effective as any traditional channel letter sign but at a more affordable and effective cost. With the thousands of neon signs, neon art and neon channel letters out there, WSF is still one of the very few sign companies the can produce neon within the United States. 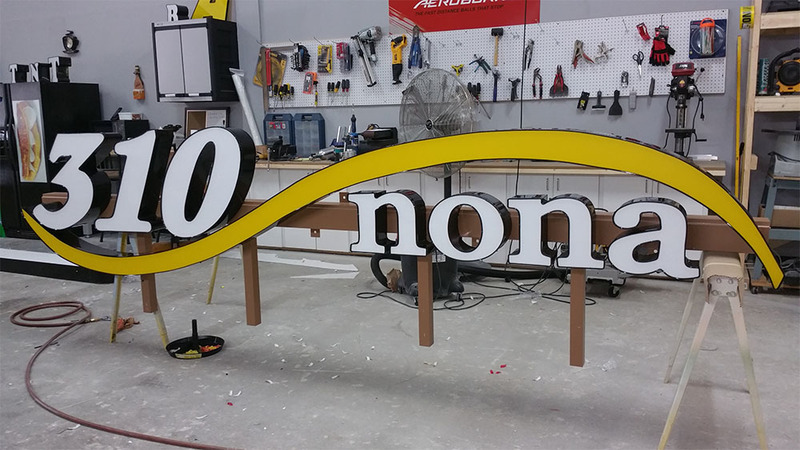 We are one of the few sign companies that can still produce neon signs in Florida. We often have customers glad to have found us still producing neon after a long search for a qualified neon letters shop. 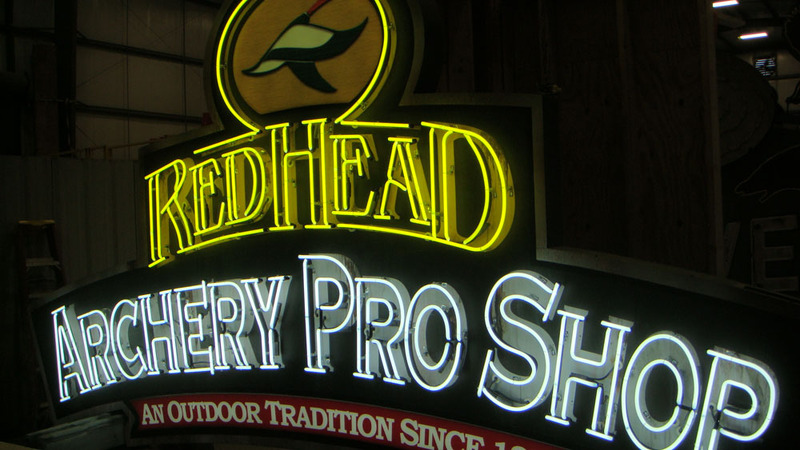 We created neon art for the Bass Pro Shops at the Pyramid in Memphis TN with over 500,000 square feet of retail space. A very demanding task that only WSF was able to provide. Some cities are now trying to preserve and restore their antique neon signs. The fabrication of a neon tube sign can only be produced by skilled craftsman know as a master glass bender. Neon tubes are made to be 4’ to 5’ in length and are basically straight sticks of hollow glass. Then the master glass bender will shape the neon tubes usually by heating it in certain places until the desired form is achieved. This type of signage is very practical for indoor and outdoor use. They create a visual in depth making them more noticeable than vinyl letters or hand painted letters. They can be mounted directly to any surface. Dimensional letters are cut out of different types of materials like aluminum, Acrylic, PVC and Foams and can be made in any font style and an ample variety of colors. Cabinet signs also known as light box signs usually are mounted flush to a building wall. This type of sign is an economical product for displaying your business name. They can be illuminated and non-illuminated, Illumination source can be HO Lamps or LEDS. Cabinet signs can be fabricated and customized to your needs. Allowing you a variety of construction shapes and possibilities, cabinet signs allow for plenty of design flexibility . From architectural signs, aluminum routed faces with acrylic push through out logo and lettering, If changeable and readable lettering is a need we offer digital Prints on translucent faces. Cabinet signs are an excellent choice for a business in a shopping plaza. If you are looking for a uniform desirable look for the appearance of the building, cabinet signs is the way to go. It makes it much easier and affordable for a new tenant to just replace the print on the face of the existing cabinet sign. Graphic Design is a complete and innovative way of visual communication. It provides you the opportunity to take advantage of producing any custom designed image and color with creative alternatives, in any size, shape or style you require. From windows, walls, monument signs, illuminated logos, the use is unlimited and the results are outstanding. Window Graphics are a very effective way to showcase your business to consumers and draw their attention away from your competitors. We can produce your window graphics using a variety of different products. Well-Designed window graphics will get you noticed. Vinyl comes in a variety of colors and can be cut into almost any wording or design. Vinyl are also known as decal stickers and have innumerable applications. 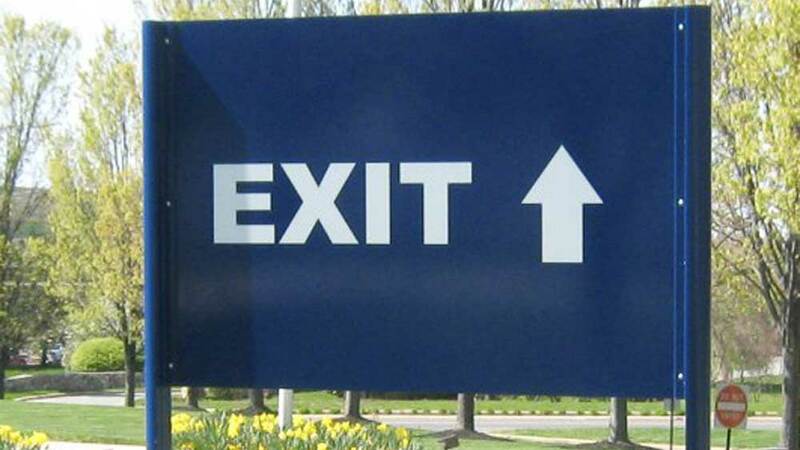 Vinyl is a product that is usually incorporated in most signage to display a message to clients. You can see them every day and everywhere you go, on the panels of signs at the entrance of shopping plazas, on street signs, on directional signs and many others. One affordable tactic for businesses is using vinyl lettering on the windows of your store front. Vinyl lettering on windows also provide an effective method for businesses to provide information to clients. By utilizing the space available as much as possible you can make consumers aware of your business and the services that you can provide. Vinyl is also a great way to display the business hours and phone numbers on the front door of your store. Monument signs are freestanding signs that assist in the identification of a building or entrance. A monument sign can also be useful tool in drawing attention to your facility and increasing awareness of your business. This type of signage provides advertising to potential customers that pass by and see it. Good first impressions are crucial and investing in this type of signage can get your business the good impression it deserves. Wholesale Signs Fabricators understand how important your business is for you. We can provide you with ideas and designs to fabricate your monument sign, the best location to place it, the best angle and the best way to display them. From acrylic faces, routed out aluminum with push through out letters and logo, with changeable reading letters to LEDS message Boards. We can make your monument sign Illuminated and Non Illuminated, in any style and shape, with the colors of your preference. More often you see monuments signs at Retail Buildings, Shopping Malls, Office and Retail Buildings, Schools and Churches. The decision of getting a monument sign will crush your competitors, the impression you make will last forever. These are pretty similar to monument signs in fact they are very much related, we look at them like cousins. The difference is that they are placed at heights with one or two steel pipes and usually are double sided. They are designed for better visibility at greater distances. They can be seen at gas stations and hotels across from the highways. A Pylon Sign is also a better and more efficient way of using the space to make customers aware of the presence of multiple business in the same building. Investing in a pole sign is excellent for businesses who want to be noticed from a distance. Post and panel signs are more common than you would realize. Your message can get across in a very affordable way. This type of sign is a simple and unique solution when you are limited on the space available or on the allowance of the city ordinances to have a custom monument sign within the area where your business is located. It is remarkable the various use they can provide to your business. Post and panels are perfect for site identification and to provide information to your customers, like entrances, exits or a drive thru. Their are many ways a business can benefit from this type of signage. We create custom post and panels for every situation in a wide variety of designs and materials. we can deliver options that will fit your budget. Post and Panels can be made of different types of materials like Aluminum, Aluminum Composite, PVC, and MDO. With the message on the front and back. Most often you seen them at developing sites and are only temporal signs. In addition to choosing your materials for your post and panels we offer design options to display your message: Vinyl Lettering, UV Laminated printed graphics, dimensional lettering and logos.